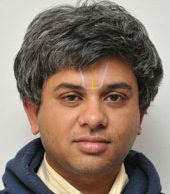 Balaji Srinivasan received his M.S in Aerospace Engineering from Purdue University in 2000 and Ph.D. from the Department of Aeronautics and Astronautics, Stanford University in 2006. He finished his B. Tech in Aerospace Engineering from IIT Madras in 1998. From 2008-2016 he was serving as a faculty member in the Applied Mechanics Dept at IIT-Delhi. His research interests include Fluid Dynamics, Turbulence in compressible and hypersonic flows, Computation of rarefied flows, Numerical Analysis and High Performance Computing. Srinivasan B, Jameson A and Krishnamoorthy S, “An upwinded state approximate Riemann solver”, International Journal for Numerical Methods in Fluids, 2012, Vol 70 (5), pp. 578-602. Kumar V and Srinivasan B, “An adaptive mesh strategy for singularly perturbed convection diffusion problems”, Applied Mathematical Modelling, 2015, Vol 39 (7), pp. 2081-2091.